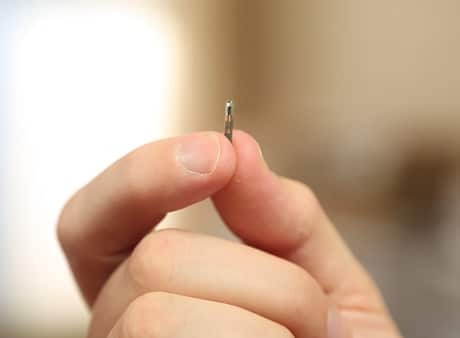 Biohacking startup Dangerous Things is seeking to raise US$8,000 on crowd sourcing website Indiegogo to begin producing an implantable NFC tag that can be used to unlock phones, open doors and share contact details with friends. The xNT tag is an NFC Type 2 tag that is encased in a 2mm by 12mm cylindrical Schott 8625 bioglass vial and sterilized in ethylene oxide gas. The team has already produced four prototypes which have been implanted into beta testers’ hands. Dangerous Things hopes to raise the money by 17 December in order to put the NTAG203-based xNT into mass production. are these people crazy or what? They need a reality check. This is the stupidest thing I have heard of in a very long time. Well, thinking rationally for a moment, what’s the problem? These are the same sort of glass capsules that have already been implanted in countless pets around the world. Sure, so it sounds like you think this is the thin end of the wedge, and that it opens the door to all sorts of evil possibilities. My understanding of NFC is that it is one of the safer technologies with respect to tracking etc because of its very limited range. This proposition seems to me no more risky than carrying a cellphone or a contactless bank card.